The talk at schools is about seniors moving on, and welcoming new students in September. Lots of emotions in the air: excitement, apprehension, finding new friends, losing old ones. Likely as not, students move from being a big fish in a small pond to being a small fish in a bigger pond. If this hasn’t happened to them before, it will certainly happen to them again, because that’s life. We’ve a choice in dealing with this: we can jump into the pool, go with the flow, and take what comes, or else we can retreat into a self-contained box and do the equivalent of living in a dark room, never venturing out. Jesus’ most often heard advice was ‘don’t be afraid’, and on several occasions he advised his disciples when out fishing to put out into the deep for the best catch, and do what they’ve never done before. There’s some good advice. Jump in and see what comes. Grab life by the … opportunities. Young people are usually much better at this than so-called grown-ups. Here’s some Stanley advice: give to the world what only you can give—you, with your combination of gifts and talents and enthusiasms. Your vocation is, in the words of Frederick Buechner, ‘where your greatest joy meets the world deepest need.’ So go for it. 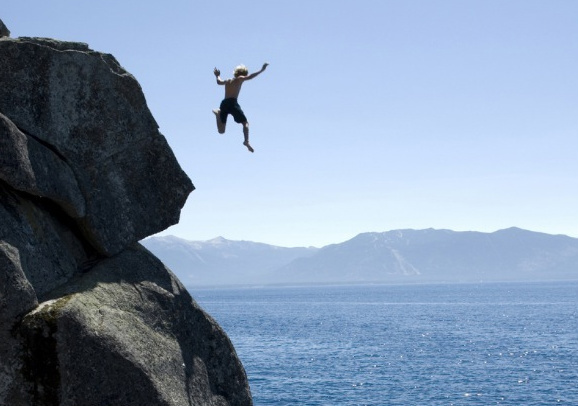 Take risks, jump in. In all this, there’s more than a whiff of the need for each one of us to take responsibility for ourselves. To grow up, in fact. This process starts at birth, and is not helped by the indulgent over–cosseting that people and organisations provide for those who should learn to stand on their own feet. This is not the same as selfishness. Selfishness comes from ignoring and trampling roughshod over the needs of others, whereas what I’m talking about is a matter of equipping oneself with the skills and attitudes that enable us to serve others. When you’re in an aeroplane and the safety announcements come on, the instruction is to get yourself sorted out before dealing with other people. Yes, there’s a fine line between this and self-obsession, but you’re no good to anyone else if you can’t breathe yourself. So here’s a message to all of us responsible for the nurturing of young people: we’re doing them no favours by mollycoddling them. I spent 30 years nurturing students, so I have some experience to draw on when I write this. We do them no favours if we confuse love with sentimentality. C S Lewis said (something like) ‘God wants us to get out of the nursery and grow up’, a message that reflects the teachings of Jesus whose healings always included the afflicted coming to terms with the reality of their situation. No pretence. No mollycoddling. The laws of nature are inexorable and totally unsentimental. And human behaviour, which could be merciful, often isn’t. We need to deal with the world as it is, not the world as we wish it to be. Then our own healing can begin. At the moment, I am reading about Old Testament prophets, Amos in particular, who wrote at a time when people had become greedy and had stopped following values of decency. The wealthy elite had become rich at the expense of others. Farmers who once served local communities had been forced to farm what was best for foreign trade. And people say Holy Scripture is irrelevant to modern life! God bless this mess. That phrase comes to me from Jack Nicholls, the former Bishop of Sheffield. He is convinced that despite—or maybe because of—the mess of the world, what we need is simply more prayer and more parties. Prayer is what you do when you talk (in your head, often) to something or someone outside yourself. You already do that—it’s just a matter of directing it and listening to the response. More parties—there’s a thing! We were driving through Birmingham on the M5 one evening during the Muslim festival of Eid and there were fireworks all round. Why don’t we Christians celebrate our major festivals with that kind of visceral fun? There’s a challenge for repressed Anglicans. Rise to it! Party on!